Welcome to the third week of our WeAllSew National Sewing Month Challenge! You can read all about our month-long challenge (and the fabulous prizes you could win) in our post here. It’s all about the tools! 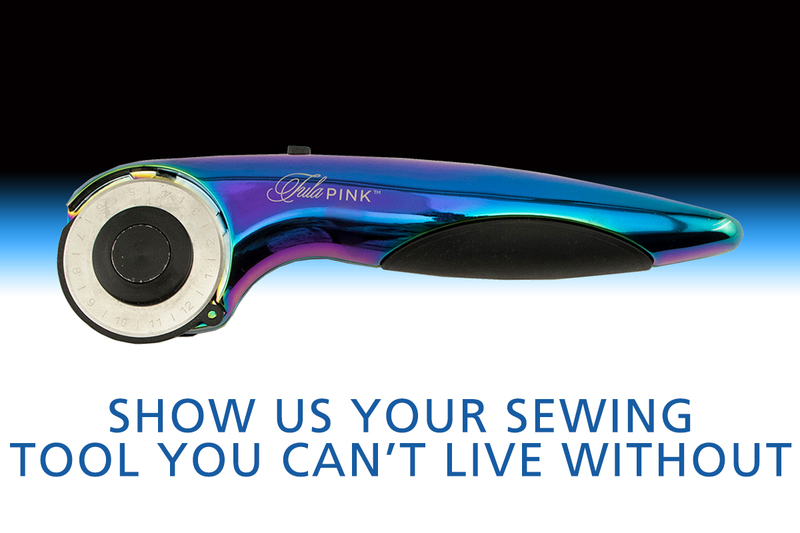 What is the one sewing tool that you just cannot live without? Upload photos and a short description in a post to our Community Section “National Sewing Month Challenge 2018” section by Sunday, September 23, and you’ll be entered in our contest for a chance to win this week’s prize. Fans who enter all four of our weekly challenges will automatically be entered for a chance to win our grand prize! If you’re not familiar with posting in our WeAllSew Community section, click here to see all the details. 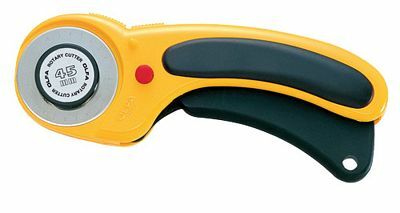 Our National Sewing Month Challenge Week 3 prize is one Olfa Ergonomic 45mm Rotary Cutter! This tool is shaped perfectly for comfort when cutting. I need my rotary cutter. If fact, the prize is my favorite one. There are so many useful tools that it’s really hard to pick one. But the trio of a rotary cutter, self-healing cutting, and acrylic ruler top my list. I tried to paste a photo but it didn’t work! I cannot live without my trusty seam ripper(s). I have one stashed at different locations around the house and in my various totes that I take to sit and sews. My Bernina sewing machine, of course, but next to that would be some very fine pins that allow me to match seams without any bulk or shifting. My most necessary tool is a seam ripper. I would think my favorite sewing tool would be my two Bernina machines-440 QEE and 350!! I just can’t live without my ergonomic screwdriver to help me loosen the screw to change my needle since I am older& have carpel tunnel. My wonderful seam ripper. Without its forgiveness I would have never made anything it makes anything doable. I practice the art of reverse sewing and also teach it so my Clover ripper would be it. SO many tools to choose from in the basics. Now if we talk piecing I would say fork pins are my must use item. Slows down my piecing, yes. But if your like me; over critical. Then it’s a must for those lines to meet. The rotary cutter is my favorite quilting tool–so much quicker than just scissors! I consider my trusty Bernina a machine so that makes a rotary cutter my favorite tool. There is no way I could cut accurately without it. . . wide strips, squares, slivers or curves, it does it all in the exact size or shape needed. I find my Bloc-Loc half square triangle trimmer so helpful. What tool can’t live without?……. one tool leads to another…. rotary cutter, mat, ruler, sewing machine, That Purple Thang, scissors, ripper(unsew tool)… it’s a chain reaction! Just can’t live without my clapper. I can’t live without my thread clippers that can hang from a lanyard on my neck. So easy to find and use! I think I’m with the majority of commentators that the rotary cutter is my most useful tool. An excellent pair of fabric cutting scissors is a must have tool in my sewing room. My favorite tool is my scissors!! Then my laptop of course. My favorites include those little clips that oftentimes take the place of pins! I consider my Bernina embroidery machine a tool the same as a carpenter has his power saws, drills, etc. I have had 3 other sewing machines over the course of my life before recently getting my first Bernina. When I took my first class to learn about it all I could think was WOW…this is something else entirely It has many “tools” built in, but has the ability to do so much more than my previous machine which was also a well known brand. I am so looking forward to my Bernina experience & learning my machine thoroughly to create beautiful items.